Cammie was born in Khartoum, Sudan on June 9th, 1979. Judy and I were there to learn Arabic, the lingua franca of Sudan. 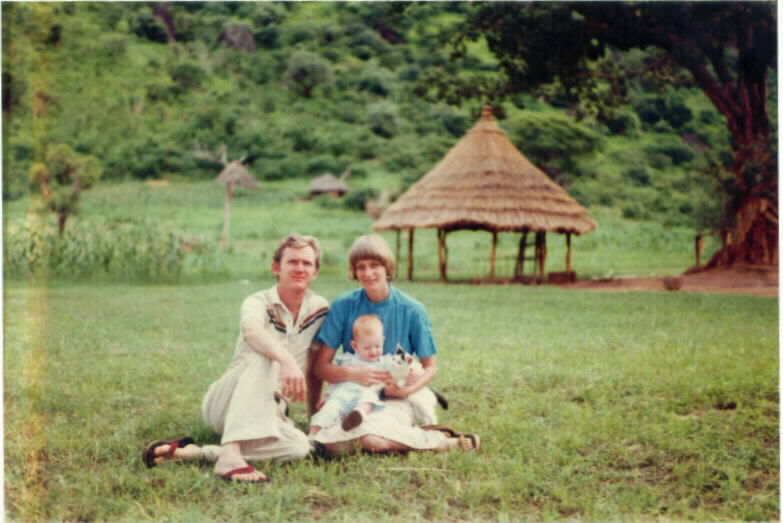 That fall we moved out to the village of Chukudum in the Didinga Hills in SE Sudan to start a translation of the Bible for the Didinga people. All was well. This is what we had trained for. We liked to tell people we did not live at the end of the earth…but we could see it from there. We built a mud-walled, thatch roofed house. We got started on language learning. I got to go hunting on a regular basis. We loved it. In early 1981 we knew something was amiss. There was something wrong with Cammie. We took her to Nairobi and ended up at M.D. Anderson hospital in Houston–a renowned cancer research hospital. She had Botryoides, a rhabdomyosarcoma that was considered 100% terminal. We started on an experimental cocktail of drugs and against all odds she survived and was in the first tier of survivors. Ever. She is alive and well, 36 years old, married, and has four adopted girls (all sisters). She has also had two recurrences of that cancer, one at age 19 and one at age 24. Both times they used the same drugs as the first time and now she has had a lifetime limit of radiation and those drugs. Our lives were suddenly and irrevocably changed. Thus began an odyssey that had some very dark moments. But there was also a silver lining. Stephanie and Amanda came long after Cammie and we took them on doctor appointments, they were there for the many surgeries, the recoveries, the works. And both of them developed an interest in medicine. Steph is now a physician living and working in Waco, Texas (and is married and has given us three grandchildren), and Amanda is a nurse, also living in Waco. People cope in different ways. For me just jotting down my thoughts was cathartic. What follows are a selection of those thoughts spread out over a good number of years.